Can you ever imagine that a single text message is enough to hack any Facebook account without user interaction or without using any other malicious stuff like Trojans, phishing, keylogger etc. ? Today we are going to explain you that how a UK based Security Researcher, "fin1te" is able to hack any Facebook account within a minute by doing one SMS. Because 90% of us are Facebook user too, so we know that there is an option of linking your mobile number with your account, which allows you to receive Facebook account updates via SMS directly to your mobile and also you can login into your account using that linked number rather than your email address or username. This particular webpage works in background when user submit his phone number and verification code, sent by Facebook to mobile. That submission form having two main parameters, one for verification code, and second is profile_id, which is the account to link the number to. Change value of profile_id to the Victim's profile_id value by tampering the parameters. 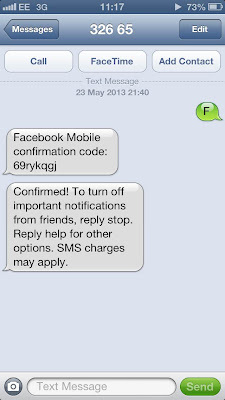 Send the letter F to 32665, which is Facebook’s SMS shortcode in the UK. You will receive an 8 character verification code back. Enter that code in the box or as confirmation_code parameter value and Submit the form. 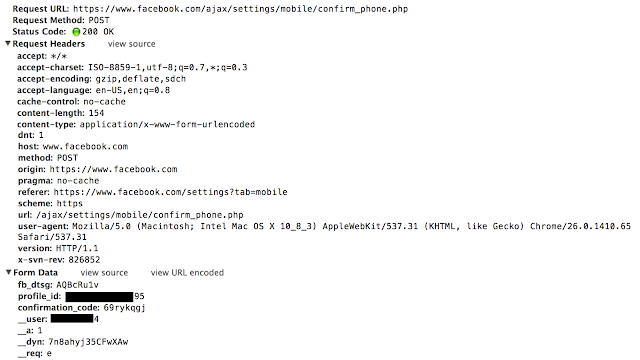 Facebook will accept that confirmation code and attacker's mobile number will be linked to victim's Facebook profile. In next step hacker just need to go to Forgot password option and initiate the password reset request against of victim's account. Attacker now can get password recovery code to his own mobile number which is linked to victim's account using above steps. Enter the code and Reset the password! 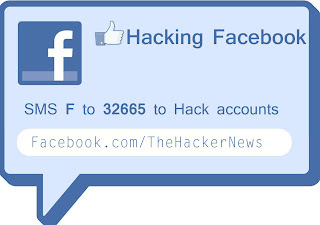 Facebook no longer accepting the profile_id parameter from the user end after receiving the bug report from the hacker. In return, Facebook paying $20,000 to fin1te as Bug Bounty.